As its name would imply, KPIs, or key performance indicators, are specific and critical numbers used in your automotive repair business and across our industry to tell the business owner about the health of their business. Many of these KPIs are actually generated during the sales process with your customer. The most important KPIs are generated during the estimating process. Other KPIs are managed differently, such as controlling operating expenses, having the correct compensation plans in place for all production personnel (technicians) and having the costs of your service writers (or service consultants) expressed differently. These numbers are more often expressed as a percentage against sales. Let’s look at perhaps the most important KPI of them all – Net Operating Profit, or NOP for short. Net profit derived from your business is the only reason for being in business in the first place. NOP is what’s left in your account after techs and service consultants as well as the rent, lights, gas, water and Autologic software updates have been paid and after federal and state income tax. Most shops, unfortunately, only walk away with single-digit net profit (less than 10%). However, NOP over 10%, and even approaching 20%, can be done. It is being done. These elite business owners already understand most of what we’ll be covering in this material. Each KPI measures its own corresponding performance. Let’s take an example of Labor Gross Profit Margin (GPM%). The criterion for this KPI is your shop labor rate, less the cost of your technician. There are two ways to look at this KPI, as loaded and unloaded costs. Loaded Costs include all other real costs you, the business owner, incur. This could include FICA, FUTA, SUTA, Medicare, PTO (Paid Time Off), vacations, training allowances, uniforms, etc. The associated benchmark your shop is looking to hit is 60% GPM minimum. Unloaded Costs are your shop labor rate less whatever hourly wage you actually pay the individual. This applies whether you pay a flat-rate, an hourly rate, a salary or some combination thereof. The associated benchmark your shop is looking to hit is 68-72% GPM. And usually, especially in this category, skid pad circles to measure lateral g-force. What will come from these comparisons is a bunch of numbers. A person buying one of these performance automobiles will most certainly check out all these numbers to see how they stack up. He or she will look at the benchmarks to allow them to rank one to the other. Keep in mind that benchmarks for the performance car are going to be drastically different from the econo-box class of car. You’ll notice that we first take into account sales from several areas. These areas are also known as “profit centers,” which will be explained below. For simplicity’s sake, we aren’t breaking our sales down further than this. However, your own P&L should probably be more detailed. The more detail you can show, the better you’ll understand your business. Perhaps you have a popular line of tires that seems to be selling well, but upon further analysis, you discover you’re not really making any profit off of them. Of the thousands of financials I’ve reviewed for other garages, I still prefer to break mine down further. 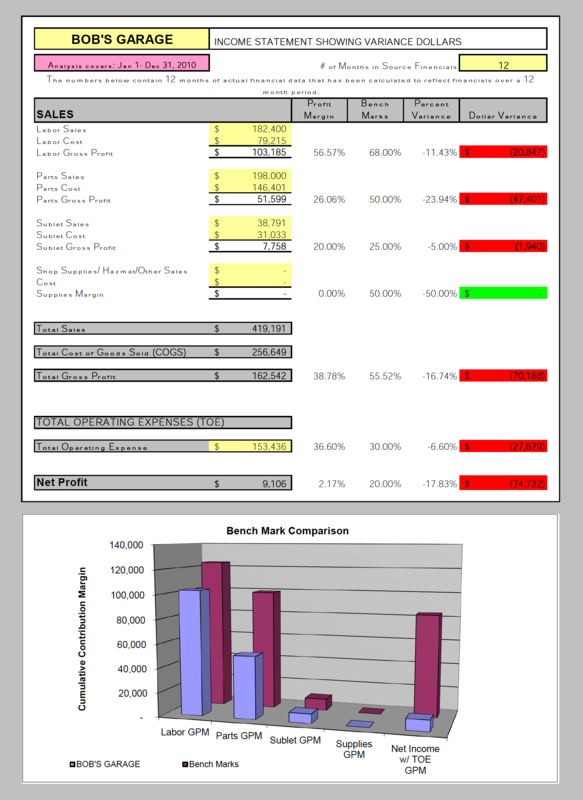 I normally get their P&L, and then transpose their numbers into my format. This way, I can get a gross profit margin on each of the critical areas, or profit centers, such as labor, parts and sublet and shop supplies. Profit center analysis is nothing more than understanding that your business is made up of various areas from which you derive profit. And you thought it was just from fixing cars? No, there’s more to it than that. If you stop and think about it, other than the obvious profit you make on parts and labor, what else is there? Let’s take a look. Hazardous materials charges are those which you incur as a result of having to comply with regulations governing the disposal of automotive wastes, such as oil, filters, tires and batteries. And, most importantly, maintenance (PM). 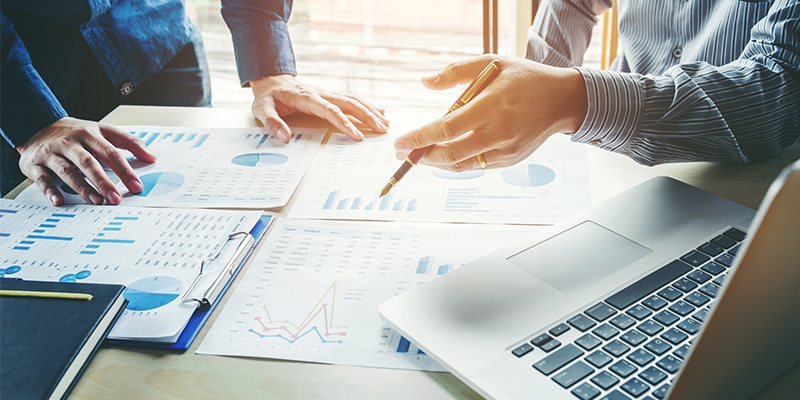 Analysis of your profit centers, tied in with the seasonal and cyclical ups and downs typical in our industry, will allow you to have a solid tool for the purpose of forecasting and trend analysis. Simply put, it’ll allow you to navigate the “stormy weather” shops usually experience around November, December and January. Likewise, when you’re wide open in the spring and summer months, you’ll be more prepared because you took the time to understand your profit centers and used that information to develop your monthly or quarterly forecast. Let’s just hope your forecast is more accurate than the local weatherman. Beside the title “Gross Sales” on your income statement will be some number (hopefully a big one). What is that number made up of? Do you really know? Shouldn’t you know? I always ask shop owners “what percentage of maintenance work does your shop do?” Most of the time, I get the deer-in-the-headlights look. It should be apparent that your shop must have a strong computer and solid accounting and management software such as an R.O. Writer. What’s cool about good quality software is that you can slice and dice the numbers any way you can think of. Don’t get too carried away, but do find out where your profit centers are. A good production technician should produce somewhere in the neighborhood of $10,000 to $12,000 labor sales per month and bring in approximately $20,000 to $22,000 in gross sales per month. Technician labor is NTE (not to exceed) 25% of the shop labor rate. Compute as: Tech salary x 1.25 (to adjust for taxes and such). Total labor expenses NTE 25% of gross sales. COGS (cost of goods sold) should max out at 25% of gross sales. If it’s more, than your prices are too low. It’s about to be a New Year – How did your shop fare in 2018? If you hope to hit your goals in 2019, then it’s imperative you have accurate numbers from 2018 to lay out your targets for the new year. A precursory understanding of the KPIs and their associated activities from which they are derived is therefore deemed essential. We’re going to take a look at a fictitious shop called Bob’s Garage. We’ll get into more about Bob in upcoming articles. W. Scott Wheeler is founder and president of the Automotive Consultants Group Inc. He is a shop management expert with more than 36 years of experience in the automotive, trucking, heavy equipment, marine, motorsports and defense aerospace industries. He can be reached at [email protected] Look for Wheeler’s companion column on the profit myth of increasing sales in the January 2019 issue of Tire Review.